So, You Want To Be A Writer? – WHO KNEW? Charles Bukowski said it best. Fantastic submit, very informative. I wonder why the opposite experts of this sector don’t realize this. You must proceed your writing. I am sure, you’ve a great readers’ base already!|What’s Taking place i am new to this, I stumbled upon this I have discovered It absolutely helpful and it has aided me out loads. I am hoping to give a contribution & assist different customers like its aided me. Good job. I completely get this, VC. Completely. I find myself composing text in my head–even when I have no access to a keyboard or pen and paper. I actually see the words that form in my head. Bare thee hence to an apothecary, then Ms. Kendrick!! Perhaps, but I’m convinced that writers or born. It takes some time perhaps to discover this and the same applies to writers who try, but aren’t. Sooner or later, you’re weened from either doing it if you’re doing it disingenuously; Or if you’ve spent a lifetime ignoring that natural impulse to compose. You can attempt to learn theory and practicum, but I’m convinced the gift is either there or it isn’t. And I firmly believe that writing well is indeed a gift, on par with singing, dancing or singing, designing, etc. By the way, Bukowski was right on so many levels. you had me at bukowski. but sidewalks is aces and your graphics are killer. Great quote V, I think Bukowski’s words should be the first thing taught in every collegiate English course. Some cats are not fit to write, period. You cannot go through the mechanical motions like regurgitating the force-fed information needed to be a CPA or a proctologist. Just like the Marines, writing is for the few and the brave (and those who can suffer ridicule and self-doubt without abandoning principles). This is a rule breaker. It could be a relief. Because the rules make me want to snap my pencil in half. Stomp the keyboard. Toss the notebooks. i almost never rewrite and this makes me feel like a criminal, an amateur. i want to believe him, but it seems too easy. 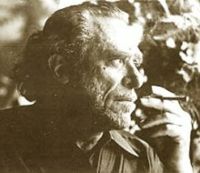 Great Bukowski … Great V.
I whole heartedly agree with Bukowski! I wrote a book that followed his mantra perfectly. The words and story could not help but be put on paper. The soul truly has thoughts that the conscious mind never knows; that book came from my heart. This gives me peace in knowing that it’s OK that I’m not ready. Amen to Hank–this should be required reading for every MFA program. My God, how long have my eyes been closed? After reading all of your posts regarding Bukowski and then taking a quick Charles Bukowski tour through the halls of Google, I’m left wanting more. Wouldn’t that be great? A Da Vinci Code-less world?